A honest and impartial comparison between Singer CG 590 and 4423. There is a huge price gap between the two, which makes this comparison worth having a look. 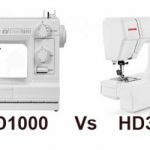 This is an interesting comparison, because you are comparing two machines that are poles apart in terms of pricing. 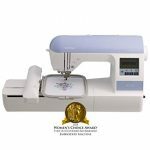 Singer calls CG 590 as commercial grade machine and 4423 comes with a heavy duty tag. 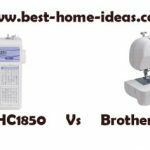 There is no doubt that both these machines have huge fan following especially the 4423, which is the best heavy duty sewing machine under $200. The current price gap between CG 590 and 4423 is huge, you can easily fit in another beginners’ machine in that price gap. Singer 4423 is the least expensive of the two. The only thing you and I want to know is, whether the extra dollars we spend on CG 590 is really worth it or not. What extras do CG 590 offer in comparison with 4423, which makes the former so expensive? Let’s find out. CG 590 is named commercial grade and 4423 has a heavy duty tag, so one would normally expect the machines to be made of all metal parts. It is not the case here. Both machines come with plastic parts. However all interior parts are made of heavy duty metal. So those who want a 100% metal sewing machine will have to look elsewhere. Nowadays it is very hard to find machines that don’t use plastic. It is an important factor in weight reduction and portability. Design wise, both machines are very different. CG 590 has an unconventional design with very vintage type dials, knobs and controls, which are not very easy to figure out. 4423 on the other hand has a more modern and user-friendly controls and dials, which you normally see on all modern mechanical sewing machines. I find 4423 less intimidating to be honest. Built-in Stitches : Singer 4423 wins here with 23 built-in stitches. CG 590 has only 18 of them. So 4423 will suit those who are looking for a bit more variety in stitches. Buttonhole : Singer CG 590 loses here with an outdated 4-step buttonhole, whereas 4423 comes with an easy to use 1-step buttonhole. Finishing a buttonhole in 4 steps or 1 steps, which one is easier? Presser Foot Pressure Control : You can’t pick a winner here as it is purely subjective. CG 590 has automatic presser foot pressure whereas on 4423 you can adjust it according to the type of fabric. If you ask me, I would prefer a machine with adjustable presser foot pressure as you can fine tune the pressure for perfect results. Stitch Width : Singer 4423 wins here as well. It has 6mm maximum stitch width whereas CG 590 has one less at 5mm. Both machines come with equally powerful motor. But I would rate Singer 4423 slightly higher in terms of performance, especially when you consider the fact that it is a very inexpensive machine when compared to CG 590. The stitch quality of 4423 is definitely a level above all mechanical machines in the price band. It goes through multiple layers of thick fabrics like denim quite easily. I am not saying that CG 590 is bad, but the performance is not good enough in comparison with 4423. 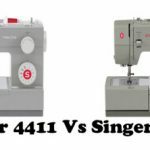 Moreover, Singer 4423 is much more user-friendly with features like 1-step buttonhole, Presser foot pressure adjustment etc (never forget the extra stitches you get). The controls and dials of CG 590 is not that easy to use. It will take time to get to know what you are doing. 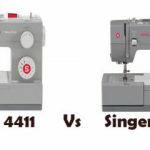 Considering the fact that Singer 4423 is way less expensive than CG 590 and also the former is slightly ahead in features and ease of use, So I would rate Singer 4423 a level higher than CG 590.